Alphonse Constantin’s home, [1911 – 1959]. 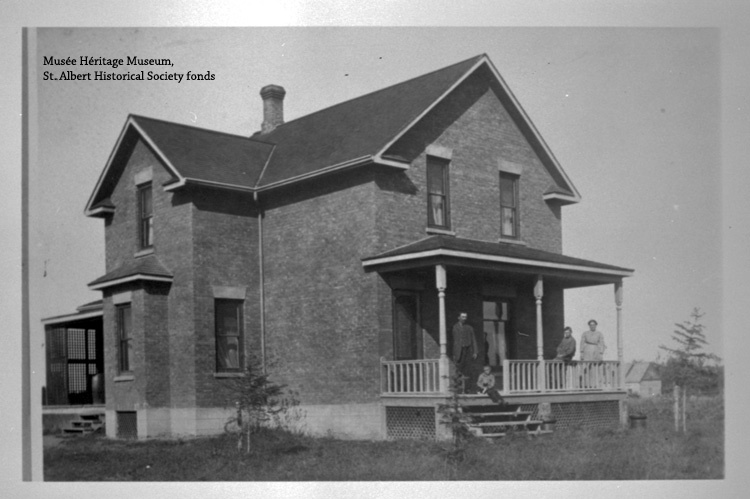 Now a quiet residential neighbourhood, St. Albert’s Mission District was once a hub of commercial activity. The Hudson’s Bay Company Post, near St. Vital Avenue, was the first commercial enterprise in the community and soon other businesses sprang up around this important centre. In 1873 Narcisse Beaudry opened the first St. Albert Hotel next to the post, at 16 St. Vital Avenue. Other businesses moved into the area in the 1880s and 90s, taking advantage of the traffic on the route to Lac Ste. Anne, Northern Alberta and the Yukon Gold Rush. Chavé and Company started a hardware store and blacksmith shop at 18 St. Vital Avenue, next door to Chastellain’s store on the old HBC post land. On Mission Avenue there was a shoemaker’s shop, and in 1885 a flour mill was built along the river. The first movies in St. Albert were shown at the Empress Hall. By the turn of the 20th century, the area was humming with activity. In 1906 the Canadian Northern Railway came through and the first grain elevator was erected. 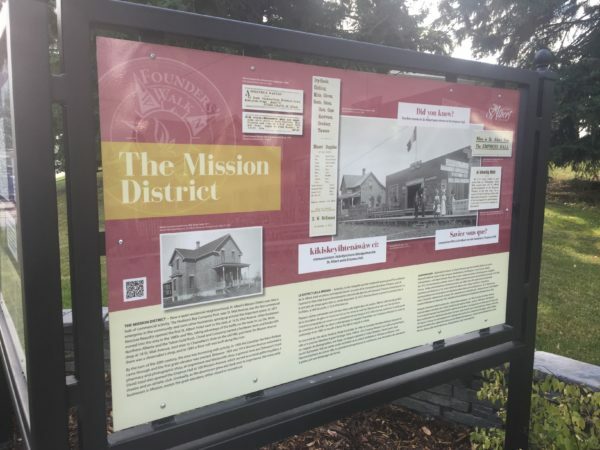 Between 1909 and 1914 Mission Avenue welcomed a pharmacy and photographic shop, an implement and blacksmith shop, a general store and Demarco’s Hotel. David Joyal also opened the Empress Hall at 100 Mission Avenue, which served as a social gathering place, a theatre and an athletic club. Gradually, as the downtown grew and took over in importance, the many early businesses in Mission, except the grain elevators, either closed or moved out. St-Albert, à côté du poste, à 16 St-Vital Avenue. Les premiers films à St-Albert ont été visionnés à l’Empress Hall. Plusieurs autres entreprises sont arrivées dans cette région dans les années 1880 et 1890 afin de profiter de la circulation de gens en route vers le Lac Ste-Anne, le nord de l’Alberta et la ruée vers l’or du Yukon. Chavé et compagnie ont ouvert une quincaillerie et une forge à 18 St-Vital Avenue, avoisinant le vieux poste de commerce de la HBC qui était à cette époque, le magasin Chastellain. Sur l’avenue la Mission, il y avait un cordonnier et en 1885 un moulin à farine fut bâti le long de la rivière. Au tournant du 20e siècle, l’endroit vibrait d’activités. En 1906, le Canadian Northern Railway traversait la ville et le premier élévateur à grain fut érigé. Entre 1909 et 1914, l’avenue Mission a accueilli une pharmacie, un magasin de photographies, une forge, un magasin général et l’hôtel Demarco. David Joyal a aussi ouvert le Empress Hall, un centre social, un théâtre et un club d’ athlétisme à 100 avenue Mission. Avec l’épanouissement du centre-ville, les premières entreprises sur la rue Mission, avec l’exception des élévateurs à grains, ont soit déménagé soit fermé. êkâmwâtahk wîkiwin, St. Albert’s Mission ayamihêwînînâhk (District) ita iyiniw kâtasiwîhcikâtocik. Hudson’s Bay Company atâwêwikamik, cîki kîhayâw St. Vital Avenue, êwako mâmawinistam osihcikêwin kîhayâw êkota êkwa wîpac kotaka osihcikêwina kîmâcipayinwa wâsakâm. îspî 1873, Narcisee Beaudry yotênam nistam St. Albert nipâwikamik sisonê atâwêwikamik, ita kâyâk 16 St. Vital Avenue. kotaka atâwêwikamikwa kîhitakonwa êkota ispî 1880’s êkwa 90’s ayisk mihcêt ayisiyiniwak pimohtahowak êkota isi Lac Ste. Anne, kîwêtinohk Alberta êkwa Yukon Gold Rush. Chavé êkwa opimpayicikêwiniwâw kîmâcipitamwak atâwêwikamikwa êkwa oyahisiwikamik anita 18 St. Vital Avenue, askoc Chastellain atâwêwikamik ita kayâs HBC atâwêwikamik askiy kâkîhayâk. Mission Avenue anita kîhayâw maskisinihkêwikamik, êkwa ispî 1885, askipahkwêsikanihkêwikamik kîwâskahikanihkêwak sisonê sîpiy. mâmawinistam cikâstêpicikana êkîwâpahtamihk St. Albert anita Empress Hall. pâmayês nîsitanaw mitâtahtomitanwâw, mêtoni kîhotamiyowak. ispî 1906, Canadian Northern Railway mâcihatoskâtamwak êkota ohci nistam kistikânikamik kâkîmâcihtâcik. nânitaw 1909 êkwa 1948 Mission Avenue kîpakitinamwak kapimipayihtâhk maskihkîwikamik êkwa masinipayiwikamik, êkwa âpacihcikana ohci êkwa oyahisiwikamik, atâwêwikamikw êkwa Demarco nipâwikamik. David Joyal kîyôtênam Empress Hall anita 100 Mission Avenue, ita mâmawâyâwinihk, cikâstêpicikan’kamik êkwa sêsâwîwikamik kâyâki. piyisk, ôtênaw kâmâcimihcêtihk êkwa atâwêwikamikwa ayiwâk kîhispihtêyihtakwanwa, mihcêt otatâwâkêwkamikwa anita Mission, kîkway piko kistikânikamikwa, kîkipahikâtêwa ahpô êwayawîpicihk.